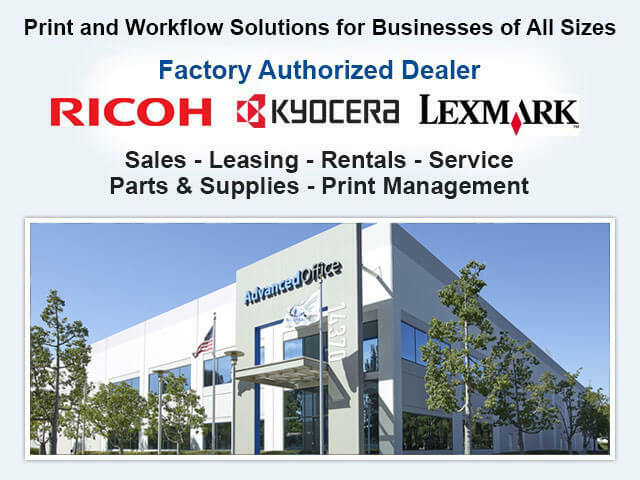 Welcome to Advanced Office, Long Beach's premier dealer for Ricoh and Lexmark products. 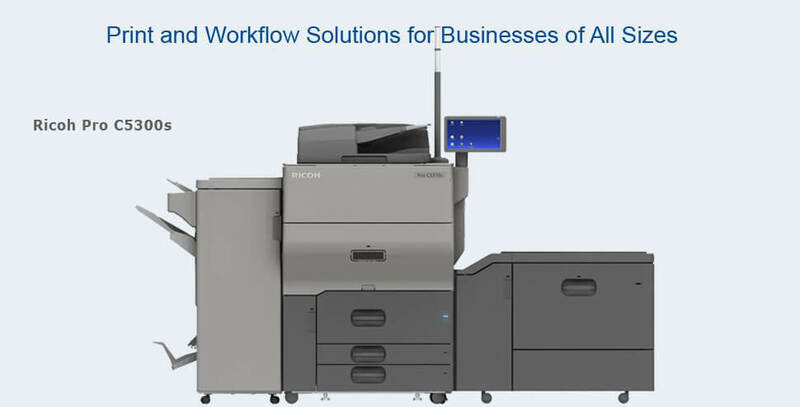 By offering innovative print and workflow solutions that are customized to each client's unique needs, we help Long Beach companies maximize their productivity and become more cost efficient. We make it possible for businesses of any size to gain access to world-class copiers, multi-function printers (MFPs), single-function printers, digital duplicators, production printers, wide-format printers, and fax machines. Our broad range of copiers and printers are competitively priced and available for sale, lease, or rent. Over the last 30 years, Advanced Office has served more than 30,000 Southern California commercial clients and become a leading dealer for both Ricoh and Lexmark. We attribute our longevity and success to the superior level of ongoing support we deliver to our clients. In addition to honest product recommendations and great rates, Advanced Office also provides exceptional copier and printer service and maintenance. Our factory-authorized technicians average over 13 years of experience and are factory trained on all Ricoh and Lexmark products. They keep their service vehicles fully stocked with the most frequently used parts and excel at first-call effectiveness. We have four offices and a local dispatch to facilitate immediate response and have worked hard to eliminate internal bureaucracy and red tape. When our clients call, we know them by name, are familiar with their circumstances, and are capable of instantly understanding their needs. Additionally, those on a service contract also receive professional, on-site product training and access to our technical help desk. Call today for a free workflow analysis at your Long Beach office. Our consultants are experts in all Ricoh and Lexmark products and highly experienced in designing custom print management and software solutions. The Ricoh name itself has become synonymous with innovation and quality. They currently are the #1 U.S. market share holder and a two-time winner of the Deming Award for their outstanding commitment to quality. Ricoh is dedicated solely to office automation products and offers a full suite of standard and advanced security features. Ricoh is also included in the list of "Global 100 Most Sustainable Corporations" and "World's Most Ethical Companies." 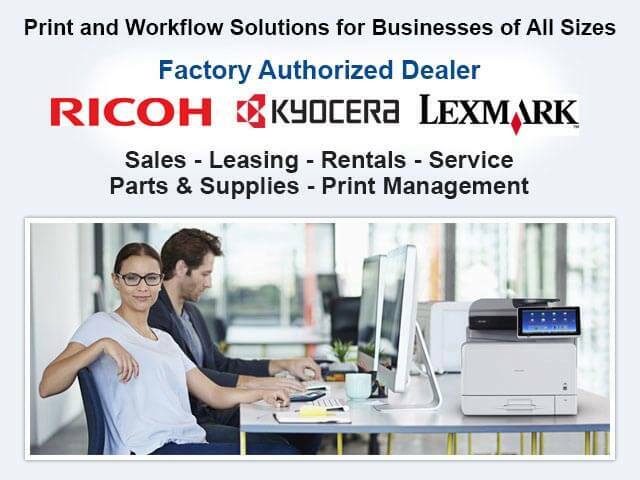 While Long Beach businesses can find a number of authorized Ricoh dealers, Advanced Office is the only dealer with the knowledge, experience, and responsive service that can match Ricoh's exceptional quality. As a result, we have become the 12th ranked dealer in the U.S. and the leading Ricoh dealer in the Western Region. We are experts in all Ricoh, Savin, Lanier, and Gestetner lines, and fully certified to sell, lease, rent, install, and service all models. 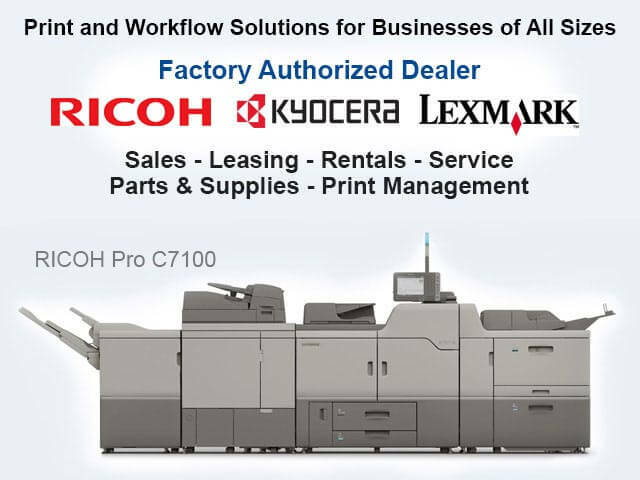 Call today to learn more about Ricoh's multifunction copiers, printers, production printers, digital duplicators, fax machines, wide format printers, and other high-performance machines. Lexmark is another leading manufacturer of copiers and printers. Headquartered in the U.S., all of its products are also designed and engineered in the U.S. They specialize in developing industry-specific solutions and their A4 devices offer unparalleled speed for the price and footprint. 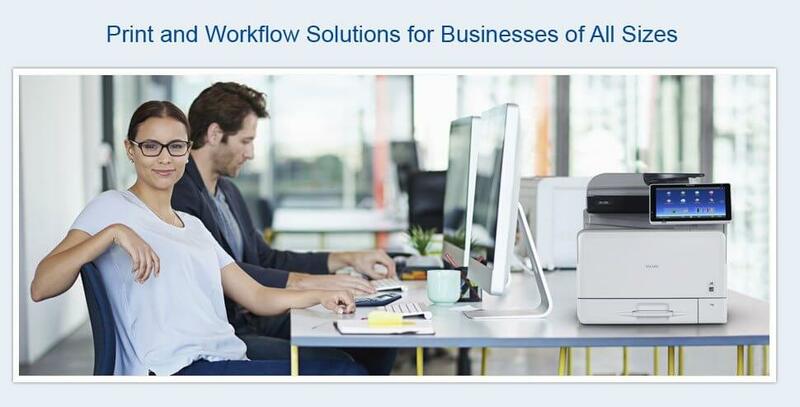 Their copiers and printers are all built with environmentally friendly green modes, advanced intuitive application-based interfaces, and comprehensive security features. It is no wonder that 75% of the world's top banks, pharmacies, and retailers choose Lexmark. Advanced Office has reached Lexmark's highest level of dealership: Authorized Lexmark Business Solutions Dealer. This means that we can offer our Long Beach commercial clients the best pricing on Lexmark's printers and multifunction devices, and also provide exclusive access to special inventory and software. Advanced Office provides the best value in high performance printers and multifunction copiers to businesses throughout Long Beach. 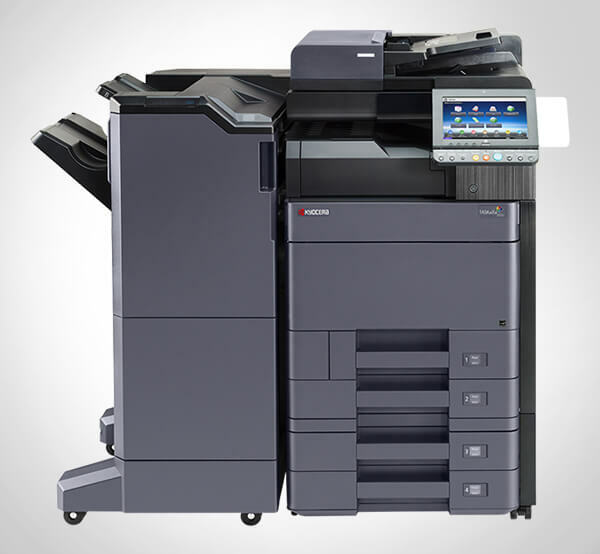 We sell and install Ricoh and Lexmark printers, multifunction copier systems, production printers, digital duplicators, wide-format systems, and fax machines at highly competitive prices, and complement them with Long Beach's most comprehensive service plans. We offer both new and refurbished options. If you are in the market for a copier or printer, call and speak with one of our sales consultants. They will provide you with honest advice and help you determine the best machine(s) for your needs, budget, and level of usage. Our sales consultants average more than 15 years of experience and understand how critical a printer or copier can be to a business's bottom line. The majority of our clients prefer to lease their copying and printing machines from us because we offer 100% financing, competitive pricing, unparalleled service, and Ricoh and Lexmark's complete line of exceptional commercial products. We lease printers, multifunction copiers, digital duplicators, fax machines, production printers, and wide-format printers. As part of your leasing contract, you can also incorporate custom software and one of our service agreement options. Call today to learn more. Long Beach businesses can speak with an in-house lease advisor about their leasing options and schedule a free workflow analysis with one of our sales consultants. For businesses in Long Beach that need a high-quality multifunction copier or printer for a relatively short term, Advanced Office offers affordable rentals. We rent Ricoh and Lexmark fully loaded devices with copy, print, scan, and fax capabilities for short and long terms--from one day to two years. Our copier and printer rentals are perfect for new or small businesses and companies that work from remote offices for limited amounts of time, such as architects and construction contractors. Call us today to speak with one of our sales consultants. Once you purchase, lease, or rent a machine from us, you gain access to our highly cost-effective service and supply agreements. Our service contracts are all-inclusive and provide unbeatable value to Long Beach companies because they keep your equipment running at optimum performance, help you avoid unexpected costs due to major repairs or replacement, and give you access to our technical help desk and in-house trainers. We feature live, local, fully trained customer service representatives and guarantee a four-hour average response time. Most importantly, all of our technicians are manufacturer trained and certified and keep their vehicles fully stocked. Plus, we keep over $1 million in parts at our local warehouse to ensure that we can meet the needs of our Long Beach clients quickly and effectively. Advanced Office has served Orange County, Los Angeles, San Diego, and the Inland Empire for 30-plus years and has a roster of more than 30,000 satisfied clients. Our team consists of over 75 highly trained employees, most with 13-plus years of industry-related experience. Our service technicians, sales consultants, product trainers, and IT staff have all received extensive training direct from Lexmark and Ricoh, and continue to stay up-to-date on all of their latest products lines. We have a local dispatch and four offices throughout Southern California, which makes it possible for us to provide fast, reliable service to our Long Beach clients.